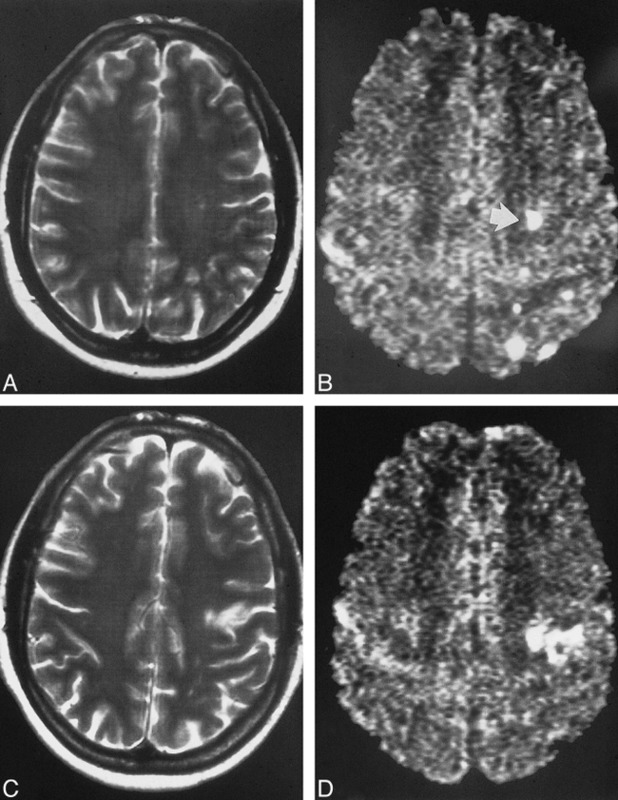 BACKGROUND AND PURPOSE: Hyperintense signals on diffusion-weighted MR images (DWIs) are believed to correspond accurately with cerebral ischemic events. Intraoperative transcranial Doppler sonography (TCD) can reveal hemodynamic and embolic events during carotid endarterectomy (CEA). Our purpose was to determine whether the occurrence of hyperintense signals on postoperative DWIs corresponds to intraoperative embolic or hemodynamic events. METHODS: Seventy-seven CEAs were monitored intraoperatively with TCD to record blood flow velocity changes after cross clamping to ascertain the presence of adequate collateral flow and to record microembolic signals. DWI was used to classify the hemisphere ipsilateral to the CEA by type: 0, no lesions (n = 51); I, cortical lesions only (n = 2); II, subcortical white matter lesions only (n = 6); III, mixed type with cortical and subcortical lesions (n = 11); IV, large territorial infarcts (n = 6); and V, other types of lesions (n = 1). RESULTS: Neither the five clinical events (one transient ischemic attack, two minor strokes, and two major strokes) nor any DWI type (I–V) showed a relationship to blood velocity decreases after cross clamping or, in patients who were selectively shunted, to total ischemic time necessary for shunt insertion and removal. Total microembolic signal count was significantly higher in the five CEAs with clinical events than in those without. It was also higher on the DWIs showing a hyperintense lesion as compared with DWIs showing no lesion. CONCLUSION: Apart from lesions corresponding to clinical deficits, CEA is associated with a substantial number of small areas of brain tissue at risk for irreversible ischemia. The main cause of intraoperative stroke seems to be embolism, suggesting that microembolic signals in CEA are highly relevant events for brain tissue. When performed appropriately, carotid endarterectomy (CEA) should have a perioperative morbidity and mortality of less than 7.0% in symptomatic stenosis (1, 2) and less than 3% in asymptomatic stenosis (3). Whether the procedure should include shunting to avoid cerebral ischemia during cross clamping is still under discussion, as reports of successful shunting are balanced by large series in which no shunting was used (4–8). Recent studies of CEA in which transcranial Doppler sonography (TCD) was used intraoperatively to detect microembolic signals have revealed a high prevalence of such signals but a low rate of perioperative clinical stroke (9–11), leading to the presumption that microemboli are of no or of only minor relevance (12). With the routine application of cranial MR imaging postoperatively, it has become obvious that new postoperative brain lesions occur but can remain clinically silent (9, 13). 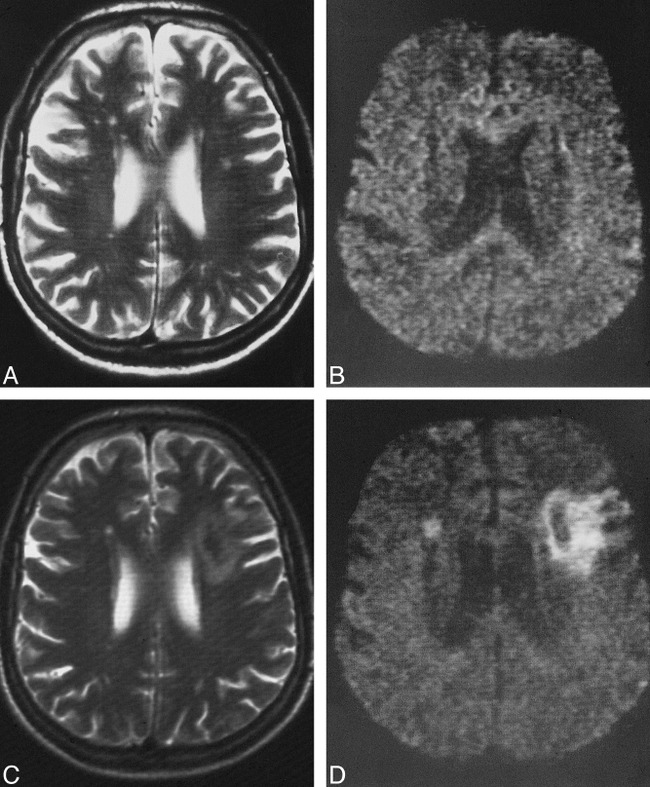 Diffusion-weighted MR imaging (DWI) in cerebral ischemia is sensitive for the detection of stroke-related hyperintense lesions. It is a matter of debate whether hyperintense signals seen after cerebral ischemia correspond exclusively to infarcted brain tissue or whether they may also indicate reversible ischemic tissue, in which the neurons are intact; such lesions may not be associated with clinical symptoms (14–16). On the other hand, there is evidence that the volume of a DWI hyperintense lesion (17–19) and the size of the embolic material (20, 21) are suggestive of the severity of clinical symptoms. We analyzed the frequency of hyperintense brain lesions on postoperatively performed DWI in patients who had undergone CEA to address two issues: first, to ascertain the relevance of intraoperative microembolic signals to brain tissue, and second, to determine whether this analysis can contribute to the controversial discussion as to whether a shunt should be routinely used in CEA. Seventy-six consecutive patients (63 men and 13 women; mean age, 64 ± 8 years) underwent a total of 77 CEAs performed under normotensive, normocapnic, general anesthesia. Preoperatively, 40 stenoses were asymptomatic and 37 were symptomatic (three transient ischemic attacks [TIAs], 25 minor strokes, one major stroke, and eight episodes of amaurosis fugax). The mean degree of stenosis was 78% ± 15% according to the NASCET method (1). The contralateral ICA was normal or showed a stenosis of less than 50% in 51 cases, a moderate stenosis (>50% to <70%) in five cases, a severe stenosis (>70%) in 12 cases, and an occlusion in 12 cases. The mean time delay between symptoms and CEA was 5 weeks (range, 2 weeks to 6 months). Before CEA, the symptomatic patients received either acetylsalicylic acid or heparin intravenously. All patients had routine cranial CT examinations preoperatively. Preoperative DWI studies were performed only in some patients at the time of the clinical event if the CT scan had shown no corresponding brain lesion. All patients were monitored by TCD intraoperatively with the machine set at previously published standard technical settings (Multi DopX4, DWL, Sipplingen, Germany; 2-MHz probe) (11, 22) for two purposes: first, to suggest (selective) shunting when the mean blood velocity in the middle cerebral artery (MCA) ipsilateral to the CEA fell, after cross clamping, below 70% of the level prior to clamping; and second, to detect microembolic signals during the period from skin incision to wound closure (Fig 1). In each CEA, the TCD recordings were saved on a digital audiotape (DAT) recorder for postoperative playback and analysis. Microembolic signals are transient high-intensity signals that are usually unidirectional within the velocity spectrum, have a duration of less than 0.3 seconds, an intensity of more than 4 dB above the background velocity spectrum, and are accompanied by a characteristic chirping sound (23). When the signal intensity exceeds the decibel range of the Doppler instrument, a microembolic signal is “overloaded” and appears bidirectional. Such overloaded signals frequently occur after reclamping (10, 11). To measure inter-rater agreement in detecting microembolic signals, we used the method suggested by Markus et al (24), which estimates the probability at which a second observer will record an abnormality if the first observer records such an abnormality. One observer played the DATs of five randomly selected CEA procedures and identified a total of 66 time points at which either an embolic signal or an artifact was recorded. Two other observers independently analyzed these time points and stated whether there was an artifact or an embolic signal. The patients were examined postoperatively by a neurologist within 6 hours after CEA, and thereafter daily until discharge. A new postoperative neurologic deficit was considered a TIA when it lasted less than 24 hours, a stroke when it lasted longer than 24 hours. In the immediate postoperative period, blood pressure was kept below 170/85 mm Hg by using intravenous nitrates when necessary. The postoperative DWI studies were performed on day 2 or 3 after CEA. Thereafter, follow-up DWI studies were not performed. Informed consent was obtained for all examinations performed (CT, DWI, intraoperative TCD, and postoperative DWI). MR imaging was performed on a 1.5-T whole-body unit. A standard circularly polarized head coil was used for radio frequency transmission and detection. In all patients, a T2-weighted turbo spin-echo sequence was performed for routine imaging (TR/TE/excitations = 4000/99/3; turbofactor = 11). For DWI, a highly diffusion-weighted single-shot echo-planar spin-echo sequence was applied. The machine has a resonant gradient set operating at 1000 Hz with a maximum gradient strength in the x-, y-, or z-direction of 25 mT/m and a gradient rise time of 250 μs. A diffusion gradient with a sensitivity (b value) of 1100 s/mm2 was applied in the slice direction. The DWI sequence parameters were adjusted to cover the whole brain: TEeff = 123, section thickness = 5 mm with no gap, number of sections = 25, matrix = 12 × 128, field of view = 240 mm, and acquisition time = 4 seconds. DWI was performed in the transverse, coronal, and sagittal planes. In highly diffusion-weighted images, all tissues and CSF have a low signal, and early ischemic lesions can be identified as areas of hyperintense signal. The high contrast allows a clear delineation of the lesions with good reader reproducibility (17). In our series, two neuroradiologists independently analyzed the 77 DWIs (Figs 2-5). Neither was aware of the patients' vascular state or clinical outcome or of the results of the intraoperative TCD monitoring. With respect to common pathophysiologic concepts of the origin of stroke (embolic: territorial and small cortical infarctions; hemodynamic: watershed zones in the subcortical white matter), the findings on the DWIs were classified into the following types: 0, no new lesion; I, presence of cortical lesion(s) only (Figs 3B and 5C and D); II, presence of subcortical white matter lesion(s) only; III, mixed type with presence of both cortical and subcortical lesions (Fig 4B); IV, presence of large territorial infarctions (with or without accompanying small cortical or subcortical lesions; Figs 2D and 3D); and V, presence of other lesion types. The number of microembolic signals is given as the median and the interquartile range. The nonparametric Kruskal-Wallis test and the Mann-Whitney U test were used to compare groups with respect to microembolic signal count. A χ2-test was used to compare frequencies of clinical events and hyperintense lesions. Concerning reader reproducibility of TCD signals at the defined time points, the combined probability of observers 2 and 3 for identifying the artifacts or microembolic signals distinguished by observer 1 was 0.97 and 0.87, respectively, indicating good agreement. Concerning reproducibility between the two neuroradiologists, both observers found one or more new lesions in the hemisphere ipsilateral to the CEA on 26 (34%) of the 77 DWIs. Each observer identified one new lesion that the other did not find. Thus, agreement between the two neuroradiologists as to the occurrence of a new lesion was excellent (chance-corrected κ value, .94) (25). Each observer detected 42 hyperintense lesions. Observer 1 classified 13 of the 42 hyperintense lesions as cortical, 22 as subcortical, five as large territorial, and two as other type (small hyperintense zone around an old infarcted brain tissue). Observer 2 classified 16 of the 42 lesions as cortical, 19 as subcortical, six as large territorial, and one as other type. Apart from territorial lesions, most of the hyperintense signals were as small as those shown in Figures 3B and 4B. Surprisingly, there was no new lesion in the area of the basal ganglia. Regarding the classification of each scan as to the five types of lesion distribution, the number of agreements/disagreements between the two observers was as follows: in type 0, 50/2; in type I, 1/0; in type II, 3/7; in type III, 6/2; in type IV, 5/0, and in type V, 1/1, resulting in an overall chance-corrected κ value of .73 (indicating good agreement). The observers reanalyzed the DWIs in which there was disagreement and reached a final decision by consensus. Thus, the hemispheres ipsilateral to the CEA were ultimately classified as follows: type 0, n = 51; type I, n = 2; type II, n = 6; type III, n = 11; type IV, n = 6; and type V, n = 1. In the hemispheres contralateral to the CEA, both observers agreed that there were no lesions except in two cases (in one, in the territory of the anterior cerebral artery, and, in the second, a few lesions in the territory of the MCA). In both these patients the new lesions remained clinically silent, and each was treated surgically for a tight stenosis associated with occlusion of the contralateral internal carotid artery. Because we did not monitor the contralateral MCA intraoperatively, the DWI results of the contralateral hemispheres are not included in our analysis. After the final DWI classification, the two observers compared the DWIs with the corresponding T2-weighted images. In light of the DWI findings, they agreed that all hyperintense lesions were also present as abnormalities on the T2-weighted sequences (Fig 3C). All carotid arteries treated by endarterectomy were patent and without restenosis or occlusion at color-coded duplex examination 6 to 7 days after CEA. In the few patients in whom DWI was performed when the clinical event had occurred, the postoperative DWI studies, except for the case depicted in Figure 4, showed no hyperintense signal that was also hyperintense on their preoperative images. Clinically, there was one TIA, two minor strokes (2.5%), and two major strokes (2.5%). All deficits were present at the examination 6 hours after surgery and affected the body side contralateral to the CEA. Further deficits did not occur. The TIA was associated with DWI type II (adequately allocated subcortical lesion, clinically), each of the minor strokes with type IV (presence of a larger territorial lesion), one of the major strokes with type II, and the other with type IV. Four clinical events (one TIA and three strokes) occurred in the group of 58 CEAs in which a shunt was not used, one clinical event (major stroke) occurred in the group of 19 CEAs in which shunting was used (no significant difference by χ2 analysis). The five patients in whom a clinical event occurred had a significantly higher total microembolic signal count (n = 36; range, 30–88) than did the postoperatively asymptomatic patients (n = 11; range, 5–24; P = .002). Microembolic signals were present in all but three CEAs. The total microembolic signal count was significantly lower in DWI type 0 (n = 9; range, 4–17) as compared with all DWIs with a hyperintense signal (n = 26; range, 12–39; P < .001). The total microembolic signal count in DWI type 0 was nine (range, 4–17); in I, 26 (range, 14–39); in II, 36 (range, 22–69); in III, 15 (range, 6–28); in IV, 33 (range, 25–38); and in type V, 9 (Kruskal-Wallis test: P < .005). When DWI types I, III, and IV are considered as a group with all lesions embolic in origin (combined total microembolic signal count, 24; range, 10–38), this group did not differ from DWI type II, and both groups had significantly more microembolic signals than did DWI type 0 (P < .005). The patients in whom shunting was and was not performed did not differ as to the total number of hyperintense lesions. The DWI type distribution in the CEAs with and without shunting is reported in the Table 1. Concerning the proportion of DWIs containing hyperintense signals, no difference was found between the CEAs with and without shunting. For the CEAs without shunting, in no DWI type was the occurrence of a hyperintense signal related to the duration of cross clamping. For the procedures with shunting, the time needed for shunt insertion and shunt removal was slightly but not significantly longer (14 ± 7 minutes) for the patients with any kind of hyperintense DWI signal than for those without a hyperintense signal (9 ± 3 minutes). In all CEAs with shunting, the total microembolic signal count was significantly higher (n = 24; range, 11–39) than in CEAs without shunting (n = 10; range, 5–21; P = .01), and the total microembolic signal count was higher (by trend) in the shunted patients who had hyperintense DWI signals (n = 34; range, 15–76) than in the shunted patients who had no hyperintense signals (n = 17; range, 6–33; P = .07). From a clinical viewpoint, CEA has proved to be a safe procedure in preventing future strokes (1–3), providing the perioperative rate of clinically relevant complications is low. When clinical events are used to analyze the cause of intraoperative stroke, a large number of patients has to be studied, because, in many CEAs, microembolisms occur that are not followed by a neurologic deficit, a result leading to doubt about the relevance of microembolic signals as a potential indicator of intraoperative stroke. The increasing experience with MR imaging and the advances made in its technological development have shown that ischemic brain lesions corresponding to clinical syndromes are detected by DWI with both high sensitivity (up to 94%) and specificity (up to 100%) (26–29). Thus, the presence of hyperintense signals on postoperative DWIs most probably indicates new ischemic lesions. We therefore used DWI to investigate the relevance of intraoperative microemboli to cerebral ischemia in patients undergoing CEA. Our clinical results are within the range of reported perioperative morbidity rates associated with CEA (30, 31). The clinical viewpoint, however, seems only half the truth. The 33% rate of new brain lesions that occurred in patients after CEA is astonishingly high, and do confirm previous studies (9, 13). Pathophysiologically, our data provide evidence that nearly all lesions arise from an embolic origin, even if they appear to be hemodynamic in origin. Therefore, microemboli in CEA seem to be highly relevant events for brain tissue, and the infarct type occurring in association with CEA may not correspond to the mechanism proposed by infarct topology (32). There are several reasons why microemboli cause no lesion or lesions that remain clinically silent. First, there is evidence that stroke severity correlates with DWI lesion size (17–19). As is known from CT studies, even large brain infarcts can remain clinically silent, which explains why three of six territorial hyperintense lesions in our patients remained silent. Second, stroke is associated with lesion location. Among all small lesions in our series, only two were accompanied by symptoms. Both were small subcortical lesions and associated in one case with a TIA and in the other with a major stroke. We therefore assume that the small subcortical lesion causing the major stroke represented an infarction in a strategic area. For all the other small lesions, it is beyond the scope of our study to state which part of the brain tissue (glial cells or neurons) was affected by ischemic edema causing no or only a transient neurologic deficit (with rapid functional or cellular recovery). Third, clinical deficit is associated with the size of an embolus (20, 21). Since, in the majority of our patients, microembolic signals were not accompanied by hyperintense signals on postoperative DWIs, it is likely that the cerebrovascular system is able to deal sufficiently with sudden arterial occlusions (eg, by thrombolysis of small emboli) (20). If such mechanisms fail to reestablish perfusion (eg, when large emboli are present), ischemia with neurologic symptoms can occur (21). Finally, the total number of microembolic signals in each procedure may be relevant. It has been reported (11) that the risk of a neurologic deficit increases when more than 10 microembolic signals occur during a procedure. Reclassifying our CEAs into those with a total microembolic signal count of 10 or less (n = 32) and those with more than 10 (n = 45) places the relative risk at 2.75 (95% CI, 1.20–6.30) that a new lesion will be present on postoperative DWIs in the CEAs with more than 10 microembolic signals (five of 32 CEAs with less than 10 microembolic signals versus 21 of 45 CEAs with more than 10 microembolic signals; χ2-test, P = .004). We found no significant difference between the shunted and nonshunted patients in terms of the frequency of strokes and the frequency of hyperintense lesions. The number of clinical events in our study was too small to allow conclusive results regarding the clinical events; however, when hyperintense lesions are considered indicative of brain tissue at risk for irreversible ischemia, then shunting does not prove to prevent brain ischemia during CEA (hyperintense lesions in 31% of the nonshunted patients versus 42% of the shunted patients). The pathophysiologic background of shunting (namely, to prevent hemodynamically caused severe ischemia while cross clamping) is counterbalanced by the increased number of microembolic signals. Fifteen of 19 CEAs performed with shunting exhibited more than 10 microembolic signals, whereas among the nonshunted CEAs, 28 of 58 had more than 10 microembolic signals. The relative risk that more than 10 microembolic signals will occur when a shunt is used is 2.29 (95% CI, 0.92–5.70; χ2-test, P = .03). Our study has limitations. 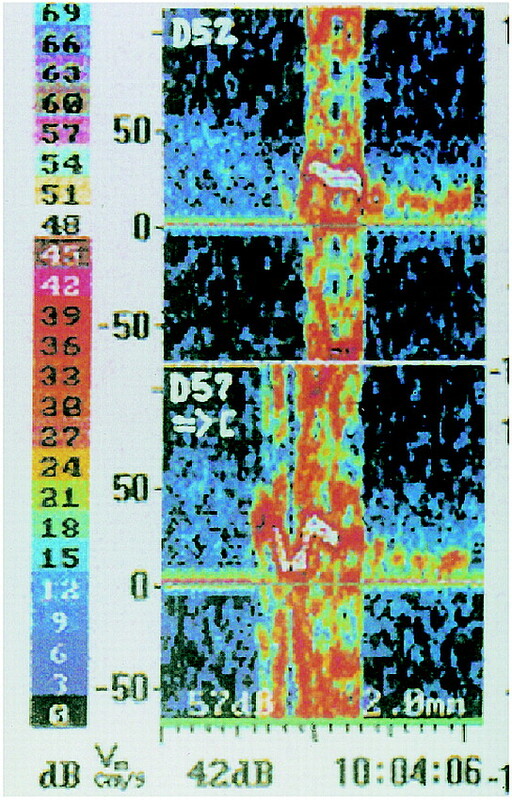 On occasion, a hyperintense signal on DWI can remain hyperintense for about 2 weeks (33), as shown in Figure 4 for the subcortical lesion. This leads to the possibility that some of our postoperative hyperintense signals may have persisted from the original clinical event. Our clinical experience with DWI in stroke patients (33) corresponds to that of Burdette et al (26), who reported that hyperintense signals after stroke remain stable for 5 days and decrease progressively during the following 10 days, and that they usually disappear completely 14 days after the clinical event, as demonstrated in the small cortical lesions depicted in Figure 4. Although we cannot say for sure, it seems unlikely that in our symptomatic patients, in whom CEAs were performed with a mean time delay of 5 weeks after the clinical event, a signal would still be hyperintense. To have resolved such considerations, a DWI study performed within a few days before CEA would have been of help. Our data suggest that, apart from lesions corresponding to clinical deficits, CEA is accompanied by a substantial number of small areas of brain tissue at risk for irreversible ischemia. The main cause of intraoperative stroke seems to be embolism, even when the lesions appear to be hemodynamic in origin. There is evidence that microembolic signals are highly relevant events for brain tissue. The proposed benefit of shunting (namely, to prevent ischemia during cross clamping) seems counterbalanced by an increased number of microembolic signals. ↵1 Address reprint requests to Martin Müller, MD, Department of Neurology, University Hospital of the Saarland, Kirrberger Str, D-66421 Homburg/Saar, Germany.